The Holiday Inn Puerto Vallarta is situated on the north end of Bandaras Bay. Located right in the heart of the hotel zone, it's close to shopping, restaurants, nightlife and the Maritime Terminal. In fact, this resort is only a few minutes away from where the cruise ships dock. When vacationing here, I found the staff to be very kind and helpful. The view from our room was breathtaking. There is a mini mall downstairs and the prices are fair. They have a concierge as well as an Air Transit Holiday Office. There is only one pool and a small kiddie area with a water slide. They do offer a kids program during the day but it did not look very exciting. They also do not offer any type of teenager programs so my kids had to spend the day either in the pool or playing volleyball on the beach. This resort offers one buffet dinner restaurant and two specialty reservation restaurants. Kids under 13 years old are Not Allowed in the specialty restaurants. I would choose the Holiday Inn Puerto Vallarta if I was with some friends or a honeymooner and I would recommend eating at the nearby downtown restaurants. As you can see in the photo below, the building to the left is the hotel and the one further in back is their suites. 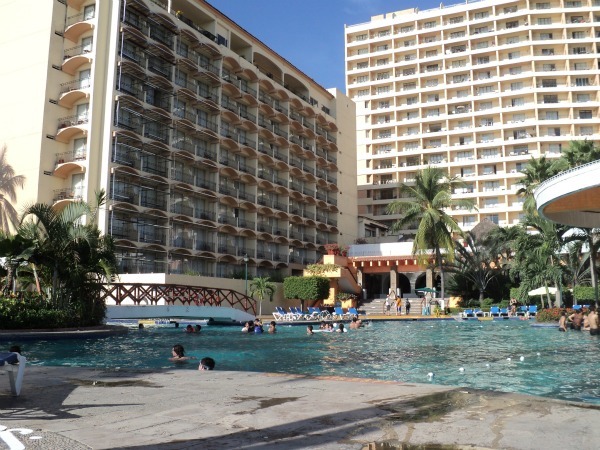 I would definitely recommend staying at the Holiday Inn Puerto Vallarta. It's not as fancy as a lot of other resorts in town but all in all, it's a nice friendly place with plenty of activities to do in the immediate area.